The hedgehogs on Betsy Olmstead's enchanted pillow make ideal nap and cuddle buddies. Betsy Olmstead's watercolor foliage and mushrooms would be enchanted enough on their own. But add hedgehogs and it's brimming with cuteness. Placed on your couch or bed, her adorable pillow brings a touch of woodland charm to your home. Each starts as an original watercolor painting that's digitally printed onto a soft cotton case. The back side is a velvety, moss green fabric that you'll want to burrow your face in when its nap time. A great gift for imaginative friends, it's kind of like having an exotic pet that cuddles 24/7. Vegan down insert included. Made in India. As a lover of life, Betsy Olmsted enjoys tending her garden while snail hunting with her boys, cooking with local, seasonal foods and entertaining and creating quirky party atmospheres. With a bold color palette, natural fabrics, and exceptional quality, Betsy's textiles are sure to become heirloom treasures and her studio is proudly part of historic Lancaster City's dynamic arts culture. Remove insert before cleaning. Machine wash, dry flat. 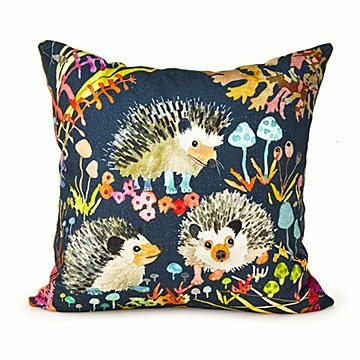 Really nice colored throw pillows with such a cute hedgehog design. They look great on my sofa!